Nikon has unveiled an update to its top of the range Coolpix digital compact camera at IFA 2013. The Nikon Coolpix P7800 is pretty much an update to last year's Coolpix P7700, bringing a couple new bells and whistles. Probably the most useful of the new features is the addition of a new viewfinder. It occupies the top left hand corner of the P7800 and has a 921k-dot resolution. That high resolution means preview images are clear and sharp. The addition of the range finder means that Nikon has had to rejig the layout of the buttons on the back of the camera. But other than the layout being moved around, there aren't any major changes to the options offered on last year's P7700. That's not a bad thing though. The Coolpix P7700 was well received when it launched last year. It comes with the same 28–200mm f/2.0–4.0 lens and 12-megapixel 1/1.7-inch CMOS sensor as the P7700. It comes with all the functions you'd expect on a top of the range prosumer digital compact. The DSLR-style mode dial on the top, along with individual controls for functions like exposure mean it is more than capable should you choose to use it instead of a DSLR. 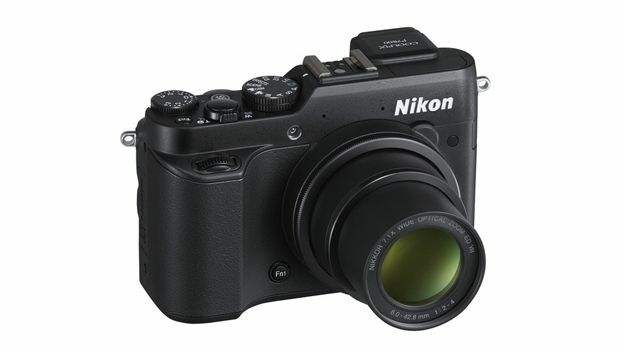 The Nikon Coolpix P7800 will hitting shelves on September 26th. It has a price tag of £499.99.